Joe Dunne said that he won’t be using the January transfer window as motivation for his players. 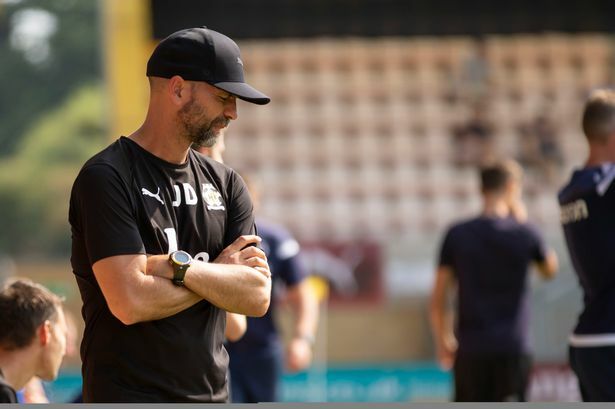 The U’s head coach has spoken in the past about the need to add to his squad, especially after similar mistakes kept popping up throughout defeats in the early part of the season. And while conceding that competition is important – and something that has increased in recent weeks with players returning to fitness – the head coach still believes he can get a lot more out of the current squad. “I would never use that (the January window) as a motivator or de-motivator,” he said. “Some people may use that and some people might not like that. “Man management and understanding the cycle of your players is very important. January is January, it’s a long time away, there’s a lot of games before then. “We’ve got to work with what we’ve got. There’s 100 per cent more in us. That’s been the part where it’s been frustrating for us. One of the concerning traits that the U’s have shown this season is conceding in batches, like they did against Rochdale at the weekend, as well as in other matches such as Newport County at home and Crawley Town away. And Dunne admitted that they are trying to pin down the reasons behind their defensive frailties after they concede. “It’s something we’ve had here for a while and it’s something we have talked about with the players,” he said. “We believe we have a strategy for when something happens and we feel a touch under pressure so we adopt a certain tactic that allows us to not concede as quickly afterward. “It’s something that we were good at last year, but sometimes when you can gauge a mood it’s about digging in and staying in the game. “We’ve been very good at that sometimes and probably this season the biggest thing we’ve tried to uncover with the team mentally is why it’s such a big contrast from last year (in terms of) staying in the game and getting a bit more resilience when that first goal goes in. And while saying it is his job to try and help the team get over these stumbling blocks, he admitted that changes may have to be made in the long-term if things don’t improve. “Sometimes when you get into that situation it’s about working as hard as you can to get through it,” he said. “We talk about January, we talk about changes, we talk about whatever you want, but sometimes it’s the responsibility of the leader to help you through it and that means sometimes you’re going to have to go again and get back on your bike,” he said. He added: “Mistakes happen, we’ve made a lot, probably too many but the key thing about mistakes is as long as you can learn from them.